Quote Management Flow (QBW) is a system workflow that defines a sequence of steps and transitions that a quote can go through as a deal progresses. 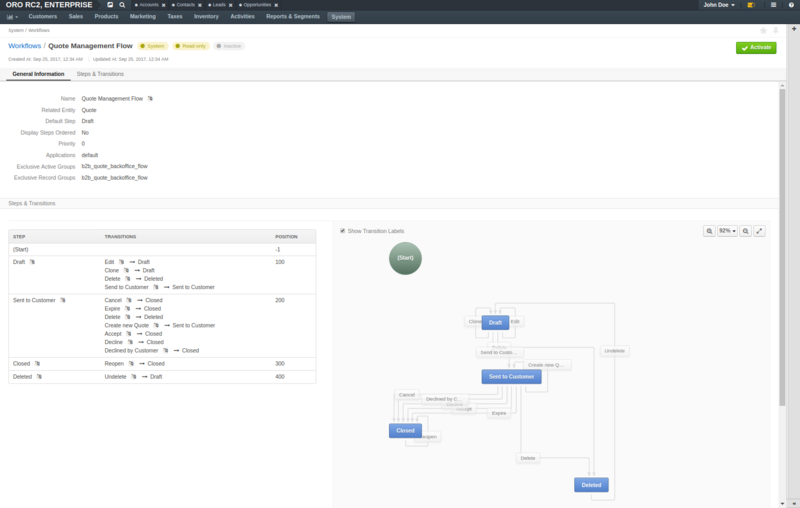 The difference between the simple Quote Management Flow and the one with approval is covered in the Understanding Quote Workflows section. 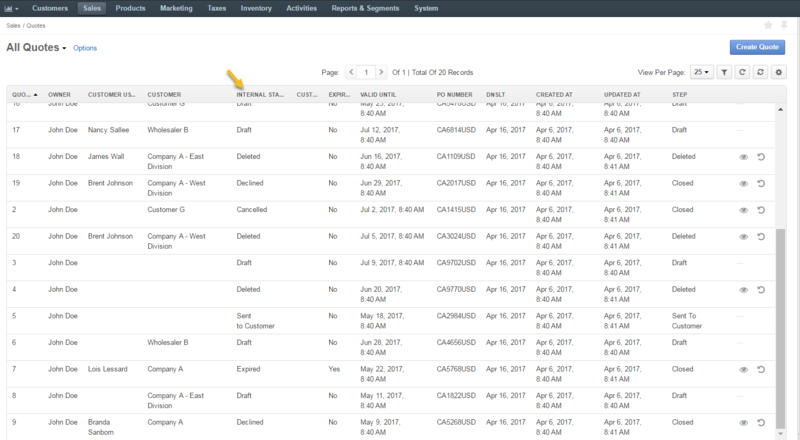 Since Quote Management Flow is a system workflow, it cannot be edited or deleted. These statuses cannot be edited or deleted. Please note that Accepted and Declined transitions for the Sent to Customer step are automatically triggered by the changes of customer statuses and they do not, therefore, take the form of buttons in the interface. 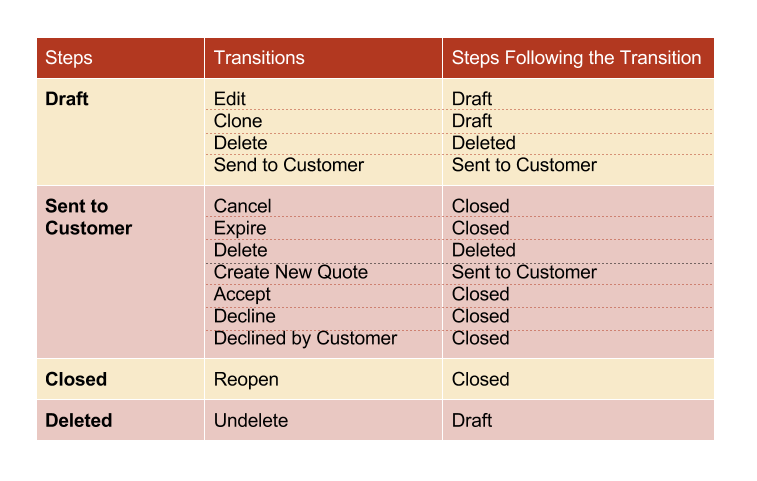 Once a quote is created, it is automatically moved to the Draft step with the possibility to edit, clone, delete and send the quote to a customer. The quote with an offer valid until 19 April is sent to a customer. The quote transitions from Draft state into Sent to Customer. Now it is possible to cancel, expire, delete, create a quote, or mark it as declined by customer. 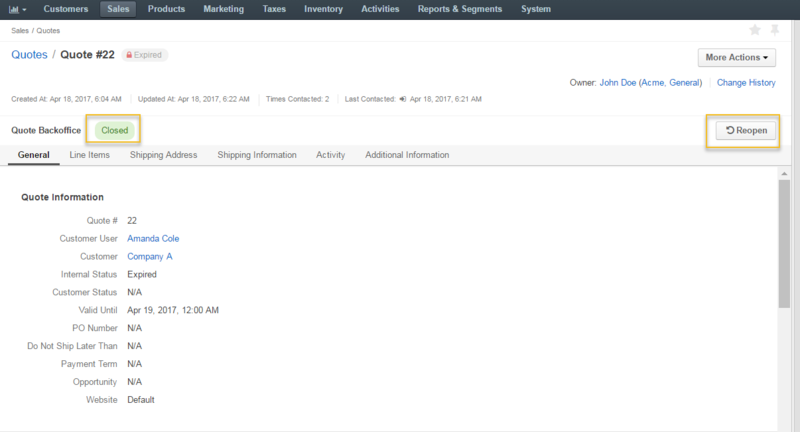 If a customer generates an order based on the quote, you can leave the quote in the Sent to Customer state so that customer user could reuse it for future orders, or expire it to disable orders based on this quote. The customer provided no feedback on the quote before 19 April, and the quote is expired by the sales personnel, leaving it in the Closed step. The offer has been reconsidered and validation date was extended until 21 April. The quote is reopened. It is moved back to the draft step with the possibility to edit, clone, delete and send the quote to a customer. The quote number is changed (in our case, from 22 to 23).